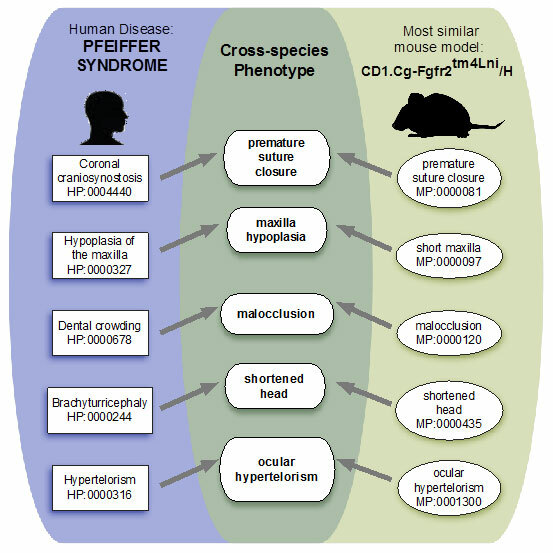 Exomiser identifies mouse models with similar phenotypes to the clinical phenotypes observed in a disease. Rare diseases that typically result from disruption of a single gene are often present at an early age and have devastating symptoms. Although individually they are mercifully uncommon, taken together, rare diseases affect six per cent of the UK population. Despite these vast numbers, half of all rare diseases are still without any known genetic association and many patients remain undiagnosed, leading to great stress for them and their families. In our recently published study, we have shown for the first time how we can use the similarities between mice and men to help in the systematic discovery of genetic variants from sequencing studies. The dropping cost of whole genome or exome (the protein-coding portion of the genome) sequencing has led to it becoming a routine research tool for the identification of variants responsible for producing a genetic disease. However, each of us typically has between 20,000 and 40,000 variations in our genetic code relative to the human genome reference sequence. Around 100 of these variations lead to mostly harmless disruptions in protein-coding genes. As a result, identifying the single disruption that leads to a genetic disease among all this other variation remains a daunting task. Usually we can’t find the disease-causing variant by simply looking at how rare a variant is or what the effect on the protein is predicted to be. To characterise the disruptions to single genes that cause these diseases, we often use model organisms, and in particular the mouse. This allows us to reproduce many of the disease symptoms when the known disease gene is disrupted (as shown in the image above). Modelling is typically used to help determine that the correct disease gene has been identified, to characterise what is going wrong in a living, whole organism and to test the effectiveness of potential drugs. In a large-scale validation study using 100,000 exomes containing known disease-causing variants we showed that our Exomiser tool, which searches for disease causing variants in genes, could recall the correct variant as the top hit in up to 83 per cent of cases. To help us find these exome variants, we used the fact that the variant that caused the disease should be in a gene that, if a mouse model exists, presents similar phenotypes, or symptoms, to those observed in humans. Our Exomiser tool, which is available on the Sanger Institute website, is the result of an international collaboration, in particular with Peter Robinson’s team at Charité University, Berlin and members of the MONARCH consortium in the USA. We aim to collaborate extensively to apply this tool to the identification of new disease genes, which is the first step towards developing routine diagnostic tests and eventually therapies. We are already analysing exomes produced by the National Institutes of Health Undiagnosed Disease Program that has recently received an extra $145 million in funding to alleviate the rare disease burden in the US and we plan to contribute to the analysis of the rare disease component of the NHS 100,000 genomes project in the UK. Damian leads a group of computational biologists in the Mouse Informatics Group aiming to make novel insights into gene function and human disease biology using the data emerging from the Mouse Genetics Project and Zebrafish Mutation Project.